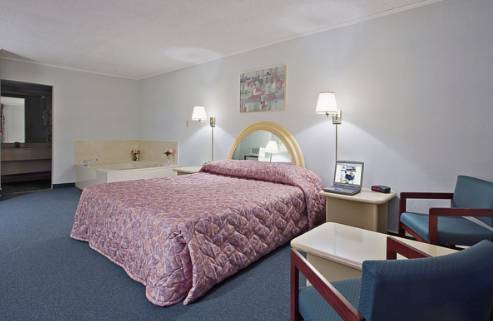 Located just two minutes from exit 120 off Interstate 20- the Americas Best Value Inn of Bishopville offers charm- graciousness- and true Southern hospitality. The Americas Best Value Inn is a charming two story- exterior corridor facility that offers 90 spacious guestrooms. Our attractive and well appointed facility is within a short distance of many of the best restaurants- golf courses- museums and attractions that Brinkley has to offer. We serve a fresh complimentary deluxe continental breakfast daily. All our guestrooms have microwaves- mini-fridges- in-room coffeemakers- cable television with HBO- iron with ironing boards- hairdryers- complimentary local calls- and free Wi-Fi throughout the property. Pets are welcome- charges and restrictions apply. For our business travelers we offer fax and copy facilities. For additional safety we have electronic door locks- smoke detectors- superior exterior lighting- and a 24-hour front desk staff. Our property is located just minutes away from Sumter Air Force Base and Darlington Speedway. Come- relax and enjoy the best hospitality in town at Americas Best Value Inn Bishopville. Bishopville- the county seat of Lee County- was settled in the 1800-s and was originally called Singleton-s Crossroads. Lee County is South Carolina-s largest cotton-producing county and home to the South Carolina Cotton Museum- located in downtown Bishopville. Original tools- interactive displays- and amusing stories in an authentic setting allow you to experience the cotton cultivation way of life. Bishopville is also home to one of the most breath-taking attractions in South Carolina- Fryar-s Topiary Gardens. This three-acre garden is visited annually by thousands of tourists and has been seen by thousands more on television specials and in dozens of magazines. The Americas Best Value Inn-Bishopville is located just off of I-20 at exit 120 and just 20 mile from Sumter Air Force Base.